Barbieri was a Baroque painter from the Bolognese School, who because he was cross-eyed gained the nickname Il Guercino, meaning the squinter. He had a flowing style of painting that was emotional, where his figures seemed highly animated and full of energy. The artist was born in the city of Cento in the province of Ferrara of the Emilia-Romagna Region. It is said that he was largely self-taught, but living in Bologna he was influenced by the work of Ludovico Carracci (1555 – 1619). Carracci, from a family of painters, including his well known cousins Annibale and Agostino, had a distinct emotional style that implored broad gestures seen in his figures. This style became largely characteristic of Guercino’s works. He had a tremendous output of work with over 100 documented altarpieces, additional to many other paintings and drawings. His contemporaries included Benedetto Gennari (1563 – 1658) also of Cento and Guido Reni (1575 – 1642) of Bologna. He was invited to Rome by Pope Gregory XV (1554 – 1623) and in his two years there produced several works, including a portrait of the Pope, now in the Getty Museum in Los Angeles. During this time in 1623, Guercino painted his masterpiece, The Burial of Saint Petronilla, a large, dramatic fresco for a chapel in Saint Peter’s Basilica. 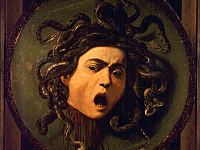 He also painted a popular Mythological fresco for the Casino di Villa Boncompagni Ludovisi in Rome, known as the Aurora. 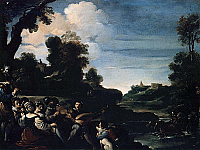 The villa is sometimes even called the Casino dell’Aurora del Guercino in the artist’s honor. Of his non religious or mythological works are pieces styled almost as pastoral or genre paintings, such as Summer Diversions, which is now in the Uffizi Gallery. Guercino had a number of pupils and did not stop painting and teaching until death.